In March 2017 Sea Walls has come to Napier again. 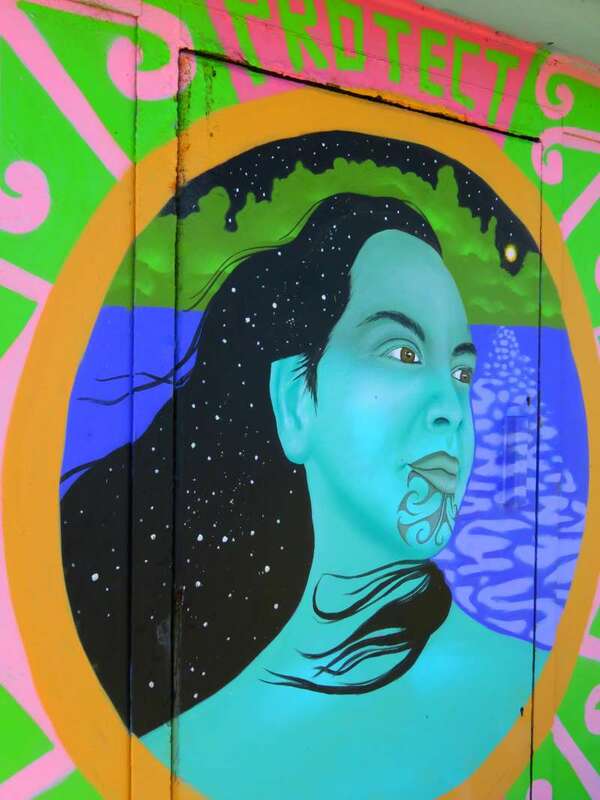 Judging by the works in progress, this year's murals will be as beautiful, bright and thought provoking as last years. Marine Protected Areas - Interrelationship Between Species & Habitats by Jason Botkin & Cinzah. At the National Aquarium of New Zealand on Marine Parade. Endangered Seabirds by Charles & Janine Williams. At Napier Port. Marine Protected Areas by Aaron Glasson. At Nelson Quay, on the lighthouse. Hammerhead Data Translation by Lauren Ys. At West Quay. Ocean Pollution by Elliot Francis Stewart. At West Quay. Plastic Pollution by Meggs & Phibs. Opposite the Napier City Council. 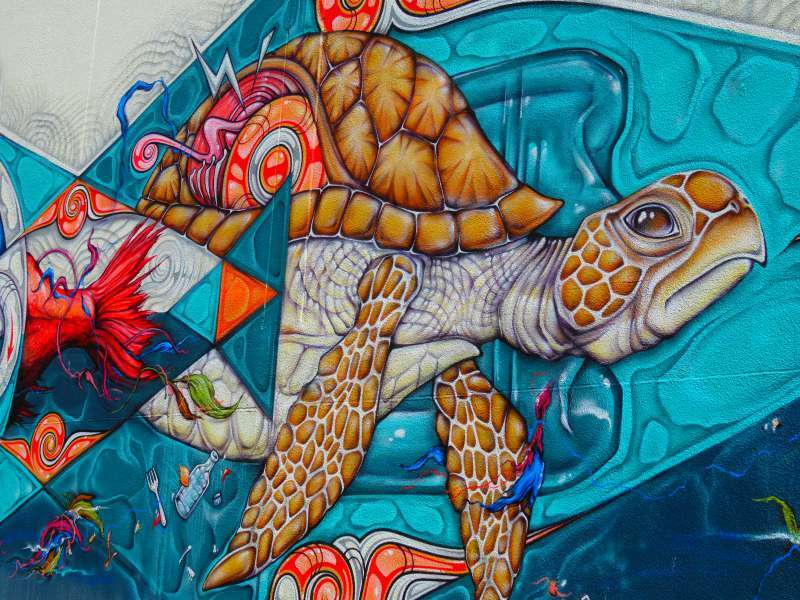 Climate Change - Ocean Acidification by Askew One. The Napier City Council building in Hastings St.
NZ Endangered Seabirds by Celeste Byers. Dickens Street in the car park. I have a favourite. Do you? Tell me in the comments section which one you like best. Pick up a pamphlet at the I-Site & Visitor Information Centre. It contains a map showing where to find the murals as well as a short blurb on each. 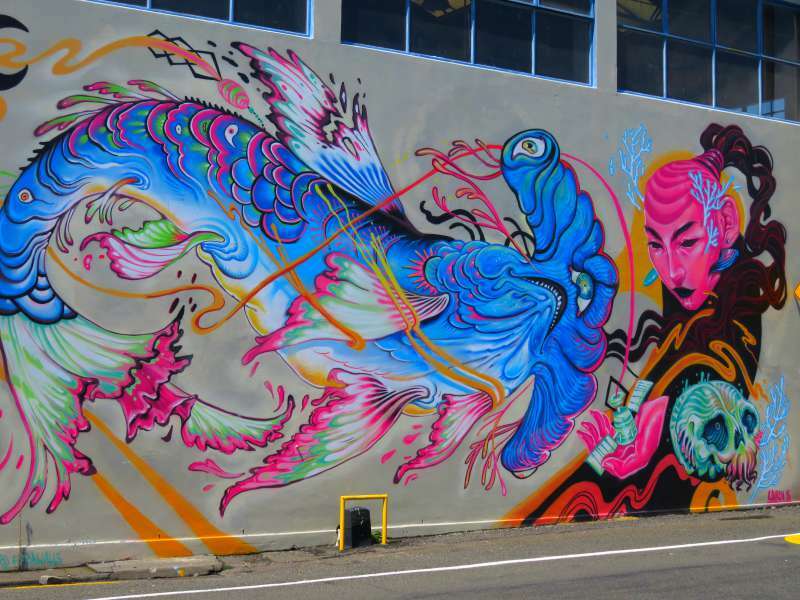 Follow @aai_nz or @pangeaseed on Instagram to see some of the works in progress. Be quick if you want to see the artists at work, the 2017 Sea Walls Festival ends on 26 March. I hope they don't paint over the previous years paintings, but find another 29 blank walls throughout the city. These pictures are beautiful. Haha - I hadn't thought of that but there seemed to be plenty of blank walls around town so I don't think they paint over the old murals. It is great isn't it. Those are spectacular murals. I'll have to get to Napier and see them in person. I like the bright colourful octopus. The octopus is my favourite too. The mural itself is huge. I love the look on the sea-snake's face ,as if he doesn't quite know how he came face to face with the octopus. 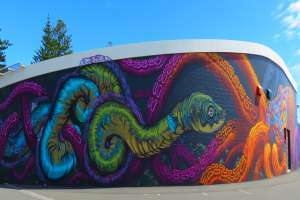 The octopus and the sea-snake, which are together in one mural were my favourites. It is great when you find really good street art in a place you didn't expect to see it. Me too. There is one in Sydney, in the Newtown area, which I keep missing. Maybe this year! We enjoy street art and hunt it down whenever we travel too. The hammerhead and the penguins are great, love the colours. What a great way to educate on environmental issues. 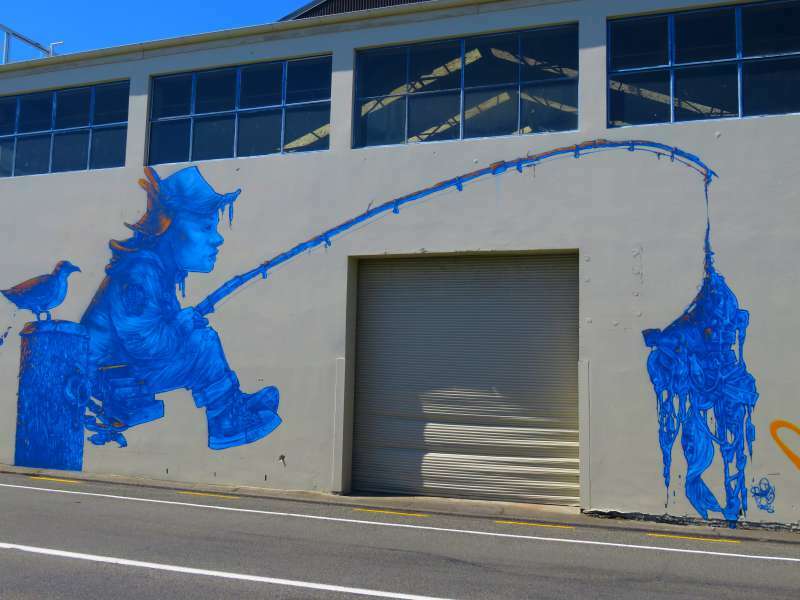 I have seen a street art post of yours on Fremantle (I think). I have tucked it away for our next visit. That was a great initiative by Napier City Council. I love srteet and public art too. It brings new life to down and out areas and enriches the lives of those who live there. :) Napier's art looks amazing. It was so nice to see street art which hadn't been defaced by graffiti too. Fabulous! I love the turtle. What a great idea to spruce up drear and dull streets. My favourite is still the snake. The look on his face is priceless. You are in good company, more than one other person has chosen the penguin. These murals are great. It's hard to pick a favourite, but I'm leaning toward Ocean Pollution. 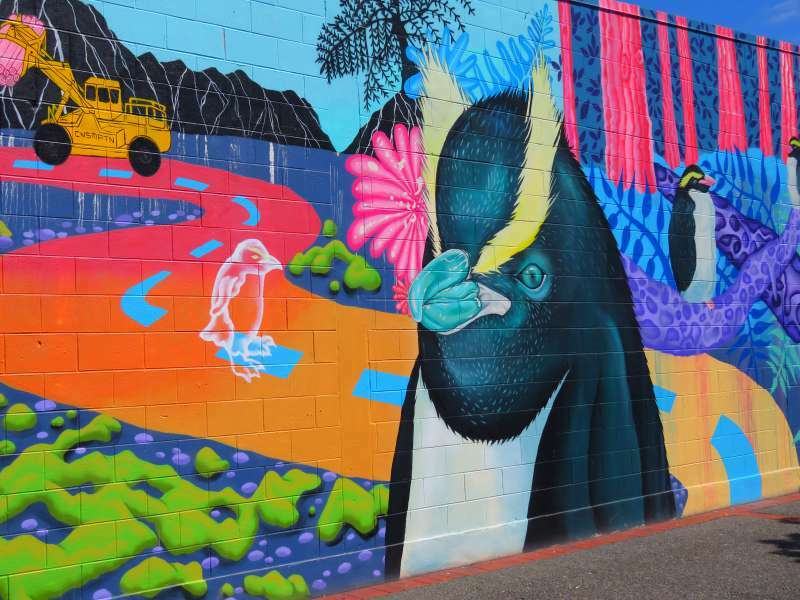 Haha - you are the first person to use the title of the mural rather than just something like 'the penguin one'. I am going to have to scroll up and check which one 'Ocean Pollution' is. These are fabulous murals. 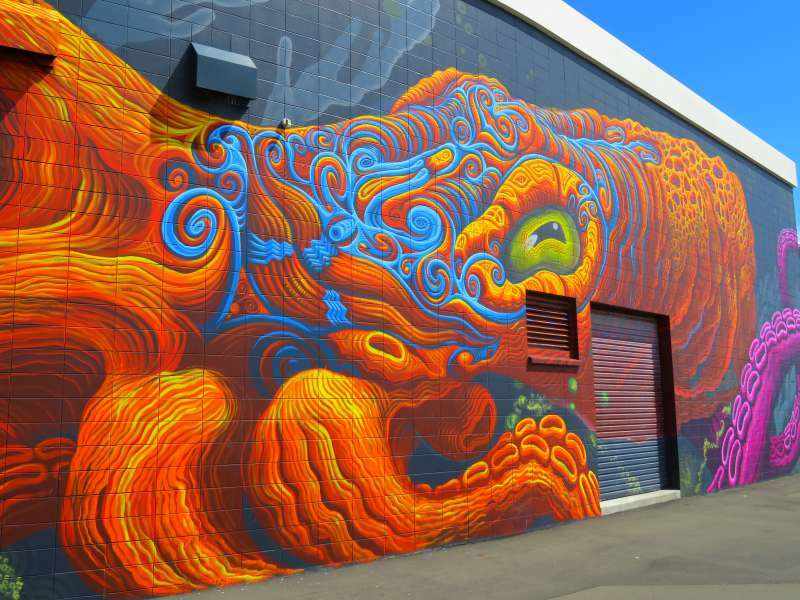 I'm thinking we may have a chance to visit Napier this fall - it would be great to see these walls! It is a long way from the west though. 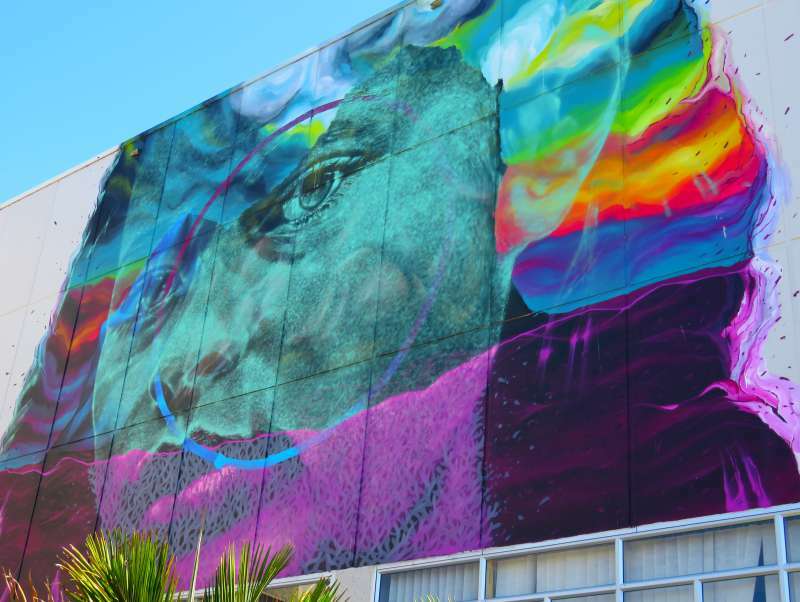 Kudos to the Napier City Council for taking the initiative to do this. 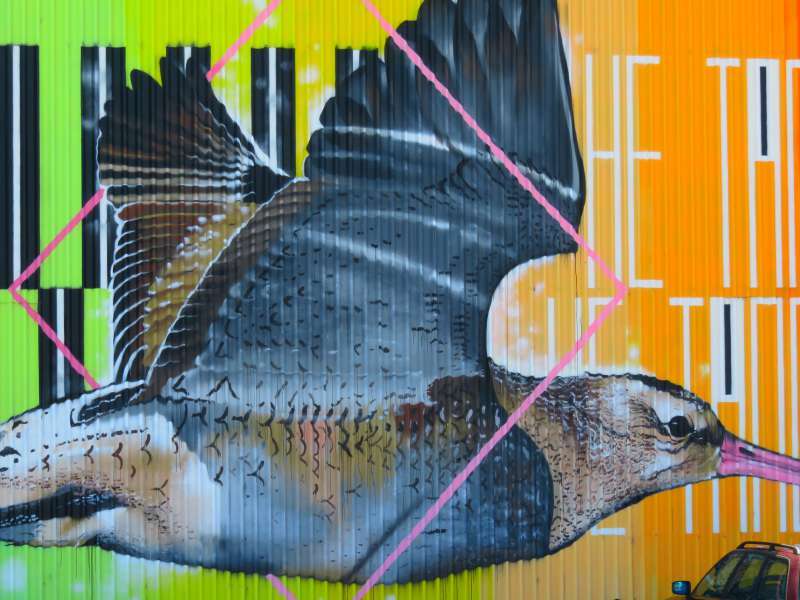 I think street art is gaining popularity in many cities and this collection was great. My favourite? Probably the first one, Marine Protected Areas - Interrelationship Between Species & Habitats. Love all the colours used. Marine Protected Areas is my favourite too. It is absolutely huge, painted on the side of the aquarium buidling. 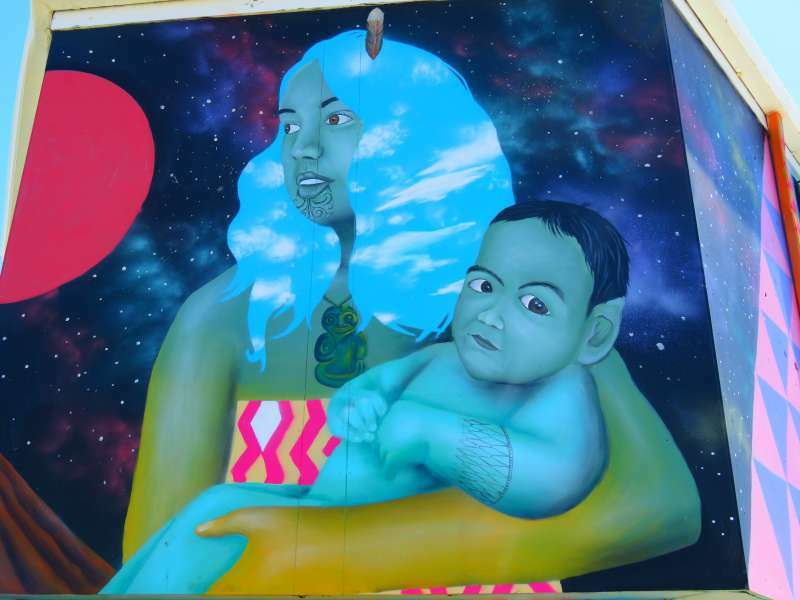 We just saw these murals in November 2016, and they were wonderful. We enjoyed Napier and wished we had spent an extra day there. There will be a whole lot more murals now. The festival was held again this year, just a week or so ago. Marine Protected Areas is definitely the front runner for readers' favourites. It is my favourite too. Street Art is definitely fast becoming one of the most popular sights to see in any city. In our RTW trip this year so many places were raving about their street art. The colours here are so vibrant and beautiful. It's great that there's a social message too. Thanks for sharing. I have noticed street art has really taken off in the last few years. 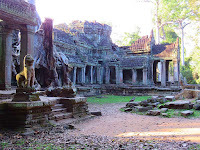 It gives me one more reason to travel - lol. Wow, these are amazing. So bright and so colourful. We love looking for street art on our travels. I am a great fan of street art. 'Epic' is a great word for it - you're right. I, too, love street art, Lyn. 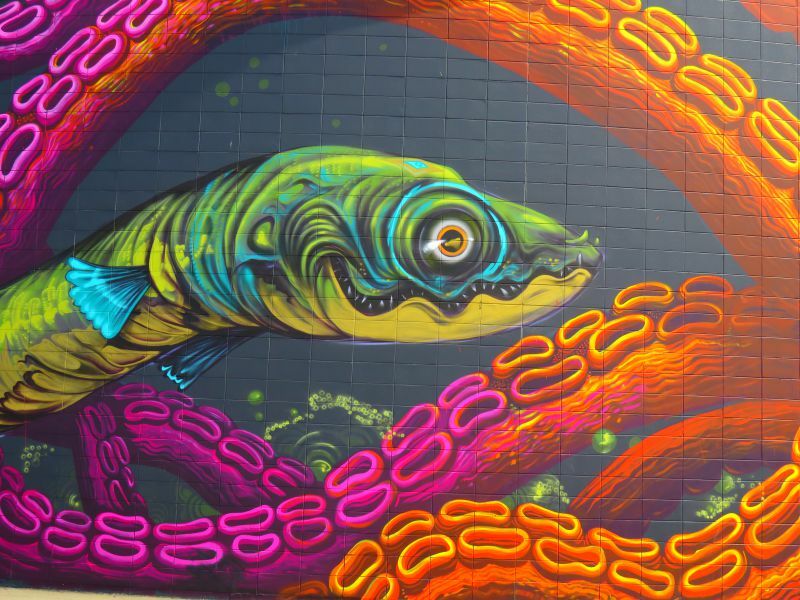 I especially love the photos you have shared of the street art at the National Aquarium of New Zealand. Outstanding! The National Aquarium photo has been a real favourite amongst my readers. Climate change - Ocean Acidification is my favorite one because of how the ocean is superimposed upon the person's face. It emphasizes the interconnectedness of humans and the ocean, to me. These are all fantastic, though. Will new ones be added for the next round or will these be painted over (I hope not). I really enjoy street art, too. The other day, I passed a massive blank side of a building and wondered why no one had done anything with it. I am pretty sure they will just add new ones. You are the second person who has asked that so maybe I should check and see. Wonderful artwork! I pinned several of them to my Pinterest board on street art! I will have a look at your board. I have a street art board too but I confess it gets neglected too much of it time. It is some of the best street art I have seen.